« Day 422 in Beijing: World Park: France. Day 423 in Beijing: World Park: Italy. Are our hands going to be bitten off? After France, we wandered over to Italy. I know that countries are close by in Europe, but this was absurd. It took about 100 feet, and one lawn, to get to Italy and check out the Vatican. I’ve seen the real Vatican and this was not a bad representation if you ignore the fact that no one was there and there weren’t lines about a mile long to get inside of it. After that we wanted to fix this strange tower that seemed to falling over. What can I say, we are helpers! So, Jill and Gulzar tried to fix it first but didn’t seem to have any luck. I jumped in and I’m pretty sure I actually straightened it out and it is in much better shape than before I got there. It cracked me up that a movie, from so long ago, would be known and loved by someone from Xinjiang, who is Muslim, and has never been able to travel outside of China so far. It says a lot about the power of Hollywood and movies. 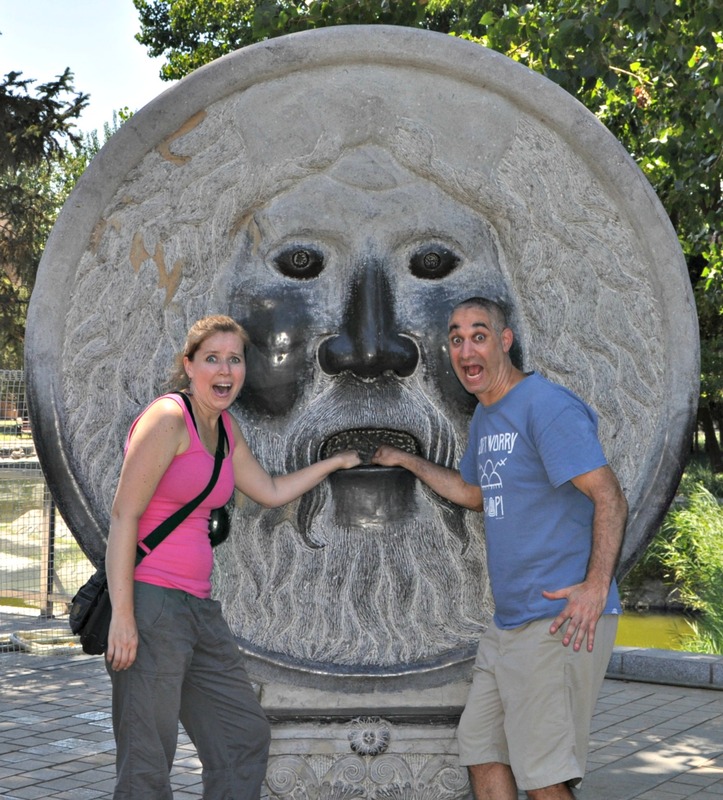 Again, I’ve been to Rome and I’ve stuck my hand into the real Bocca della Verita, and it is a bit scary because you have no way to see inside of the mouth. This one was pretty shallow and the hole wasn’t that deep so it wasn’t very scary but it was still fun. The story is, if you don’t know it, is that if you tell a lie with your hand inside the mouth, it will get bitten off. Jill and I decided to keep our mouths shut and not tempt fate.